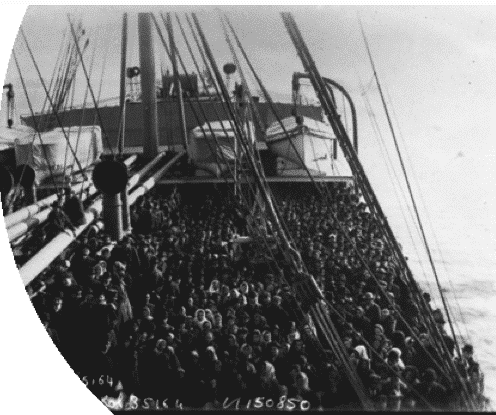 The Digital Public Library of America and Europeana are launching Leaving Europe: A New Life in America, which is a jointly curated virtual exhibition telling the story of European emigration to the US during the 19th and 20th centuries. The exhibition included digitized photographs, manuscripts, broadsheets, paintings, letters, audio, and government documents from US and European libraries. Ten institutions worked together to produce the exhibition, which features over 100 rare digitized items (many of which are being made available for the first time). Europeana’s contributing partners included the Bibliothèque nationale de France, the National Gallery of Ireland, the Jewish Museum of London, the Royal Library of the Netherlands, the Saxon State Library, and the Norwegian Photo Archives. While DPLA’s contributors included the New York Public Library, Harvard University, The (U.S.) National Archives and Records Administration, and the University of Minnesota Immigration History Research Center. This is only one of the exhibitions that are available on Europeana at the site linked above. Some of them include the Royal Book Collections, Untold stories of the First World War, From Dada to Surrealism, Art Nouveau, Yiddish Theatre in London, Hungarian Music and Dance, and many more. Check them out.